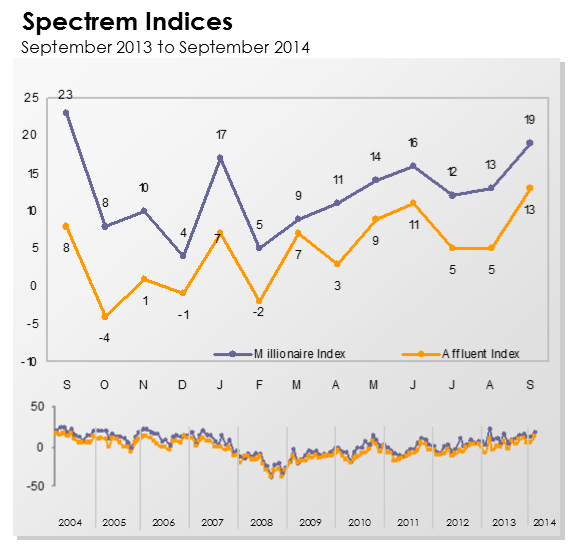 The Spectrem Affluent Investor Confidence Index (SAICI®) surged eight points to 13, its highest reading since February 2006 and the biggest month-to-month increase since last March. The Spectrem Millionaire Investor Confidence Index (SMICI®) gained 6 points to 19, a 12-month high. The Spectrem Affluent indices measure the investment confidence and outlook of households with more than $500,000 of investable assets and more than $1 million of investable assets, respectively. The September SAICI is up 5 points from the same period last year, but the SMICI is down 4 points from September 2013. This is the first time there has been a year-to-year decline in the SMICI since February-March, 2013. The September indices indicate a more positive and confident investment mindset among Affluent investors. This sentiment was echoed in the final September reading of the Thomson Reuters/University of Michigan’s overall index on consumer sentiment, which finished at its highest reading since July 2013. For five consecutive months, Affluent investors surveyed by Spectrem’s Millionaire Corner had indicated caution and wariness in the market with a steadily increasing number forecasting that they would hold on the sidelines rather than invest. Affluent investors indicted that they will be much more engaged in the market in October. Intention to invest this month in Stocks was at a 12-month high, the survey found, while Stock Mutual Funds was at an eight-month high. Another indication of the Affluent investor mindset is the Spectrem Affluent Household Outlook, a monthly measure of confidence in financial factors that impact their daily lives. After three consecutive months of declines, the September Outlook posted its highest reading since April 2007. Year-to-year, it is up 11.40 points, driven by a renewed confidence among Millionaire households in the economy. For the highest percentage of Affluent households, market conditions are considered to be the most serious threat to achieving their financial goals at this time, a reflection of heightened concern over global instability. September, too, has proven historically to be a month in which the stock market’s three leading indexes tend to perform the poorest, analysts observe.